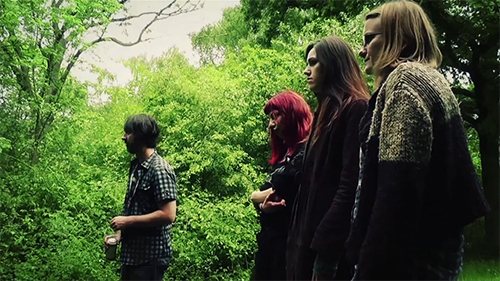 Director/Writer: Gav Chuckie Steel / Cast: Corinna Jane, Sophia Disgrace, Jane West, Dan Carter Hope, Dan Bone, Charlie Bore, John Brown, Martin Penrose. The English countryside: green rolling hills, trees older than Lionel Blair, robed-psychotics swinging blades at hapless hikers, buggered bikers (not literally), and annihilated nature lovers. The words “shot”, “on”, and “video” together in a sentence usually result in my soul crying. In fact, not so long ago I decided to give up on any camcorder bloodfests as there weren’t any good ones. Ever. Such might’ve been the case of The Shadow of Death, Gav Steel’s micro-budgeted ode to all things slashy but transplanted from the usual back roads of America to the delightful woods of England. Farnham, to be precise. First and foremost, it needs to be pointed out and then triple-underscored that this film is edited properly. I mean, like, properly. There’s none of the slapdash I-used-Windows-Movie-Maker quality to the cut. Were this shot on film, it would look big-screen worthy. Composition of photography is also energetic and interesting. It’s also been decked out with decent sound and a thought-out score, which, again circumvents the usual production pitfalls that so many of these productions fall into and die miserably into. To the story then… Over-pierced stoner Nancy wants some weed and contacts her ex, Dan, to hook her up. As he’s also out, he calls a dealer, who has tottered off to Devil’s Jump in the local woods with a bong. Nancy convinces her roommates, peacekeeper Debra and computer-nerd and plausible lesbian Jamie, to go along with them. Meanwhile, a Rolodex of randoms who have also ventured into the woods are meeting grisly ends at the hands of the mystery loon, who has no qualms about slicing eyeballs, chopping off limbs, or knocking binoculars through eyes. 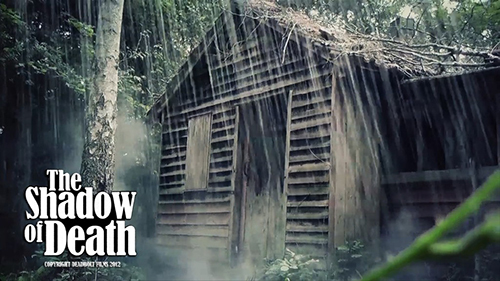 The quartet of hash-hunters soon lose their way and settle inside an old shack until the rain passes, telling scary stories until they start to venture out for various reasons and robe-man finds them. Elsewhere, a partially-sane, wannabe policeman, calling himself Supercop Craven of the Special Police, is investigating an abandoned car and happens upon the severed head of an early victim. What’s evident from watching the film is that the people who made it genuinely cared about not creating another lazy slasher title. The budget may hamper efforts to go all out and the midriff in the shack begins to drag but the effects work is especially well done, with some neat ideas for offing the pick n’ mix of victims. One guy suffers death-by-bong while a wouldbe good Samaritan finds cycling a particular difficulty after one arm is hacked off, and there’s a cool machete in the face. None of this sounds particularly amazing on the page, but none of it looks crap either. It’s bloody – but not stupid. The film is infused with references to horror films a-plenty; Dan wears an Evil Dead t-shirt and names of pubs and locales have a brain-teasing familiarity to them – and is it a coincidence the girls are called Nancy and Jamie? 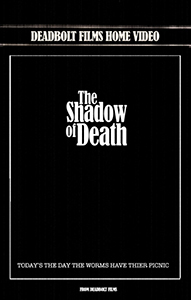 No film is without its flaws and The Shadow of Death is certainly no exception. In a similar way to The Sleeper (which, coincidentally also featured retro “VHS” artwork), which I reviewed the other week, there’s a flatness to some of the characterisations, which prevents any real bonding between viewer and threatened girl/boy/supercop. While Debra is evidently going to be the one to watch from early on, the styling of the film and its orbit of Planet Parody kept me at arms length with rooting for her survival the way that Amy Steel or Jamie Lee Curtis evoked. You had me at The Sleeper.